Winter represents different homemaking challenges than other seasons. Some things are obviously constant: toilets need cleaned, dishes have to be washed, and on and on, winter however tends to give us long days cooped up indoors and extras that come only with this dark season. 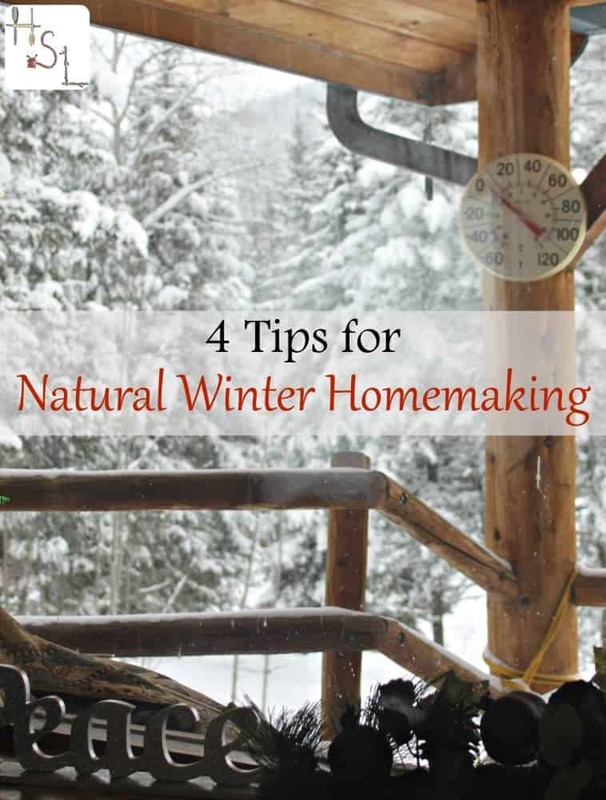 Address all those special concerns with these 4 tips for natural winter homemaking. We are real human beings living in homes. We are not wax figures in a museum. We all have different ideas of home and homemaking, please live according to your ideal not something placed upon you from the outside. Also please give yourself grace and kindness. It's okay, if the floor doesn't get mopped today and the entire family opts for game night instead. Allow some wiggle room for dust or other bits of untidiness. Find time to take care of yourself and find rest and rejuvenation. As the temperatures cool and perhaps snow starts to fall, windows tend to stay closed for extended periods of time. This alone can make the air we breathe become stuffy, don't add to the problem by using harsh chemicals. Clean those surfaces with cleaning products made from natural ingredients like vinegar and hot soap and water. Without taking care of our bodies, we can't take care of our homes. Plan and eat nourishing, whole food meals. It's so easy to fall into the trap of eating comfort food and baking cookies this time of year. I know, I'm fighting that myself a good bit of the time. However, when we eat whole, nourishing foods we're better able to fight infections and even beat colds more quickly. Soups are great winter foods that are easy and simple while also being frugal nourishing. Also, never underestimate quick meals of simple proteins and vegetables. Winter tends to come with hats and gloves and scarves and so much more. This is a season that comes with a bunch of accessories that can easily overwhelm the home. Keep it organized so that there's no searching for matching gloves and so that coats are able to hang and dry before needed again. Organization differs for everyone, of course, the most important thing here is to keep the house functional and running smoothly. As winter approaches face it and your home's special needs with confidence by keeping it simply and naturally with these tips. I so needed all these reminders – especially number one. Thank you for sharing. These topics seems to me to be the heart of homesteading – the why of what we work so hard for. I love winter for it’s slower pace to stop and think about these important things more. This was a good reminder for me. I have recently felt overwhelmed by so much never ending tedious housework with little time outdoors. I have chosen the role of homemaker, stay at home mom, and homeschooling mother. I need to remember to enjoy my daily accomplishments and the freedom to live as I want to. God has provided for my family and been good to us. I am blessed. Thank you, Kathie, for this post. I can’t think of a better way to simply put what we should be concentrating on. You summed it up so well. Do the basics, breathe, take care of ourselves, be a blessing to others, and enjoy life. Thanks for the encouragement.